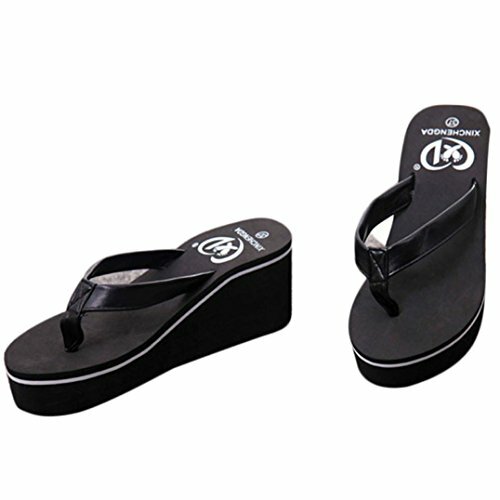 GIY flip flops are designed by your foot type, which will best fit your feet. 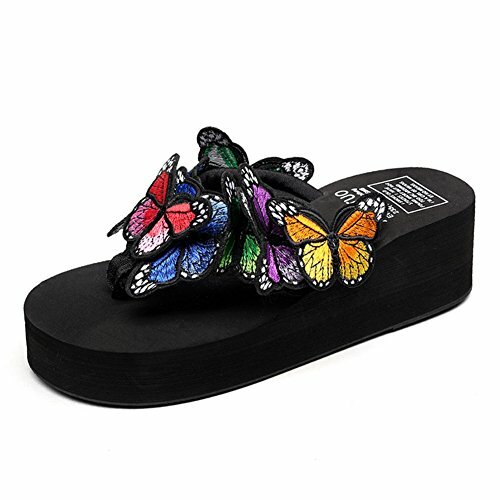 GIY flip flops are softer and more comfortable. You won't want to miss it! Size details:US=4.5 ------EU/CN=35 ------Foot Length:22.1-22.5cm/8.7-8.86"US=5.5 ------EU/CN=36 ------Foot Length:22.6-23.0cm/8.86-9.1"US=6------ EU/CN=37 ------Foot Length:23.1-23.5cm/9.1-9.25"US=7 ------EU/CN=38 ------Foot Length:23.6-24.0cm/9.25-9.45"US=7.5 ------EU/CN=39 ------Foot Length:24.1-24.5cm/9.45-9.65"US=8.5 ------EU/CN= 40 ------Foot Length:24.6-25cm/9.65-9.84"US=9 ------EU/CN=41 ------Foot Length:25.1-25.5cm/9.84-10""US=9.5 ------EU/CN=42 ------Foot Length:25.6-26cm/10-10.24"Notice:Focus on buyer satisfaction.If you have any problem,please feel free to contact us. Leather upper with sparkling straps. Man-made lining. Lightly cushioned man-made footbed. Wrapped platform and wedge heel. Man-made sole. To see more similar products, please click the brand name QZUnique or browse in our store Global Best Discount. Customers can choose US sizes directly, garment tags reflect European sizes: US SIZE: US 2-2.5; US 3-3.5; US 4-5; US 5.5-6; US 6.5-7; US 7.5-8 Return Policy: Free exchange for wrong item shipped or item damaged. For DO NOT LIKE STYLE/COLOR reason or size problem, customer's responsibility to return the items to our facility in CA, US. Due to manual measurement, it allows little discrepancy. Please be reminded that due to lighting effects and monitor's brightness/contrast settings ect., the color tone of the website's photo and the actual item could be slightly different. Thanks for your understanding! Zicac Roman Platform Shoes Summer Beach Peep-toe Shoes Bohemian Style Ethnic Chic Rhinestone Bead High-heeled Antiskid Sandals Wedge Flip Flops Features: Bohemian Style Rhinestone thong sandal featuring shining rhinestone and bead design,perfect for holiday,school,shopping,etc. Quality artificial leather and silk fabric,together with soft rubber shoe sole,durable,beautiful and comfortable for wear. Black,Apricot,two colors optional, just select one to your perference! Condition: 100% brand new, with a shoebox Heel height: about 5 cm (2") Platform height: about 3 cm (1.2") Color: Apricot , Black Size information: Asia 37：36EUR US5 foot length: 231-235mm Asia 38：37EUR US6 foot length: 236-240mm Asia 39：38EUR US7 foot length: 241-245mm Asia 40：39EUR US8 foot length: 246-250mm Asia 41：40EUR US9 foot length: 251-255mm Asia 42：41EUR US10 foot length: 256-260mm Package included: 1x pair of sandals Note: Brand new product might got odorous which is normal, keep it in ventilated place,the smell will fade away after a few days. 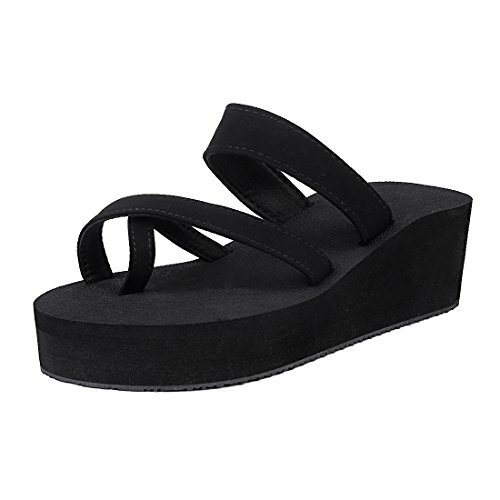 Size chart: Item Type: Womens Wedge Sandals Gender: Women Style:Fashion,Casual Size: 35/36/37/38/39/40/41/42 Color: Gold Please measure your heel to toe length and choose accurate size according to the foot measurements. Size Chart: 36 EU-- 23cm (Foot Length)-- 6US Women 37 EU-- 23.5cm (Foot Length) -- 6.5 US Women 38 EU-- 24cm (Foot Length)-- 7.5 US Women 39 EU -- 24.5cm (Foot Length)-- 8.5 US Women 40 EU-- 25cm (Foot Length)-- 9 US Women 41EU -- 25.5cm (Foot Length)-- 9.5 US Women 42 EU -- 26cm (Foot Length)-- 10 US Women 43 EU-- 26.5cm (Foot Length) -- 10.5 US Women Notice: If you have any problem,please feel free to contact us,and we will reply timely. Our products are shipped from Chinese warehouse,please wait patiently,we will try our best to ship it. because of different light and different angles to see the color is a certain difference, I hope you can understand. ✿ Sole Material: Composition Leather & EVA , which gives you comfortable feeling. ✿ Upper material: matte ✿ Heel: 3cm front,6.7cm After ✿ Function: Breathable ✿✿ ✿ US Size: 5_Width: 9.0cm/3.5" _Insole Length: 23cm/9.0" ✿ US Size: 6_Width: 9.2cm/3.6" _Insole Length: 23.5cm/9.2" ✿ US Size: 7_Width: 9.5cm/3.8" _Insole Length: 24cm/9.4" ✿ US Size: 8_Width: 10cm/3.9" _Insole Length: 24.5cm/10.6"
☀ 100% high quality & comfortable material. 2018 new clogs sandals make you more charming, feel the cool summer while showing you the perfect temperament. Item specifics Gender:Women Item Type: Sandals Upper Material:cotton Sole Material:Rubber wood Pattern:pearl Decoration:None Appropriate season:Spring,Summer,Autumn Occasion:Indoor&Outdoor,fashion,Leisure,Beach Heel Height:3cm Ahout Us RAISINGTOP is an international renowned online retailer. Our clothes with special design will make you feel more confident and charming. RAISINGTOP teams are willing to bring our customers an excellent shopping experience by offering high standard customer service based on the excellent quality and reasonable price. Customer feedback problems will be responded within 24 hours. 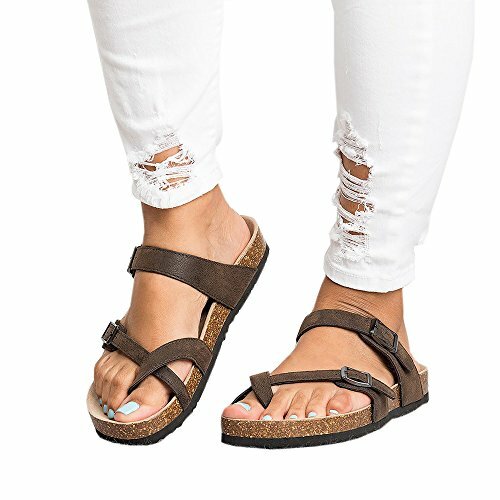 Looking for more Thong Platform Shoes similar ideas? Try to explore these searches: Care Foot Cream, Ncaa Miami Hurricanes Street Sign, and Clay Maker. Shopwion.com is the smartest way for comparison shopping: compare prices from most trusted leading online stores for best Thong Platform Shoes, Athletic Club, X-Ray Inspection System, Platform Shoes Thong . 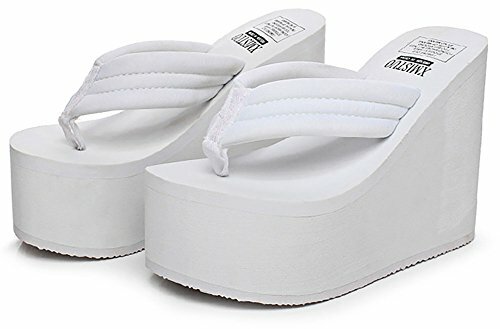 Don't miss this Thong Platform Shoes today, April 20, 2019 deals, updated daily.